It doesn't take a huge wad of cash to secure an Android tablet nowadays, but the experience at the budget end of the market can be frustratingly bad. It was only a matter time before someone aside from Google managed to produce a halfway decent, budget tablet, offering the full Android experience, but who knew it would be Tesco? Step aside Google, out of the way Amazon, it takes a British supermarket to show you how to make a jaw-droppingly cheap tablet that's actually desirable. If you're looking for a tablet for the kids, something cheap to use around the house, or an affordable option for the tablet-virgin in your life, the Tesco Hudl 2 is going be downright impossible to ignore. This is an accessible device with an HD display, solid build quality, and now comes with Android Lollipop too. You won't be shocked to find that the Hudl 2 costs less than half the price of the iPad mini 4, but it's also much cheaper than the Nexus 7 - which also isn't getting the latest Android update, although it did get a taste of Lollipop. Every little helps indeed. The Kindle Fire HDX, another competitor, has had a price drop down to £149, giving the Hudl 2 a fierce run for its money. Building on the success of the original (and now discontinued) Hudl, Tesco's Hudl 2 is bigger and better in almost every way. There's a larger 8.3-inch HD screen, a quad-core processor that Tesco claims is three times faster, double the RAM at 2GB, and a slightly improved 5MP camera. 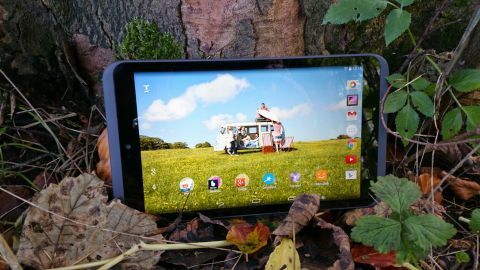 Tesco's tablet is an impressive enough entrant that it features high in our Best cheap tablets list, and we even awarded it our coveted Best Value Tablet award at the 2015 TechRadar Phone Awards. I did not expect to be charmed by the Hudl 2. It now only costs £99 (it launched at £129), it has a stupid name, and it's part of Tesco's bizarre plan to make and do everything. It was with some reluctance, reticence, and even regret that I put my Nexus 7 (2013) aside and took up my new tablet. Hudl round and allow me to explain how Tesco's tablet won me over. Google's first Nexus 7 tablet made the smaller tablet form factor fashionable, but just as smartphone displays are growing consistently larger, so are tablets. When Apple decided to enter the smaller tablet market it chose to make the first iPad mini's display 7.9 inches. Tesco takes the trend slightly further with an 8.3-inch display in the Hudl 2. That display is the first thing you're going to notice taking the Hudl 2 out of the box and it makes a great first impression. The resolution has been significantly boosted to 1920 x 1200 pixels. That's a full high definition screen that matches the Nexus 7 (2013) resolution. Colours are rich and vibrant, text is sharp and easy to read, and you can happily watch movies, game, or read on it for hours. It feels like quite a big tablet if you're coming from the older Hudl or a Nexus 7. The Hudl 2 measures 224 x 128 x 9mm. If you hold it in landscape then it's much wider and slightly slimmer than its predecessor, but exactly the same height. It's also pretty heavy at around 410g, compared to 370g for the original Hudl, and just 290g for the Nexus 7 (2013). I can hold the tablet one-handed for short periods, but if you're reading or watching a movie you'll want to prop it or your arm is going to get tired. Two hands are obviously a necessity for navigation. It does feel nicely balanced and it's satisfyingly slim. The soft touch coating on the back wraps around the sides adding grip and making it very comfortable to hold. It feels most natural to hold it in landscape and the larger bezels at either end make this easy to do without obscuring the screen. Flip around to the back and you'll find a metallic embossed Hudl logo in the centre. Two fairly large speaker grills dominate either end and the camera lens sits above the right speaker grill at the top corner. Still holding it in landscape, the left edge of the Hudl 2 plays host to a standard 3.5mm headphone port. The right has the micro USB port for file transfer and charging. Up top there's a volume rocker with a power button just beneath it. The buttons are plastic and they have a decent amount of travel. It's not hard to find and use them in the dark. The bottom edge includes an open microSD card slot for storage expansion with cards up to 32GB in size. It looks a little odd that the port is open and you can expect a bit of dust collection if you don't use it, but it's fairly unobtrusive. Further along towards the middle of the bottom edge there's a surprise micro-HDMI out connection so that you can plug your Hudl 2 directly into your TV. This is a rarity on tablets nowadays and it's one that some people will appreciate because it makes it very easy to play content from your tablet on the big screen. The Hudl 2 feels surprisingly premium and it looks good too. I had the black model for review, but you can add some colour if you prefer as it's available in blue, turquoise, orange, pink, purple, red, or white. Based on the design alone I would never have guessed that this tablet was so cheap.